another post from last week? Here’s that vanilla sock in Plucky yarn I started earlier this month. 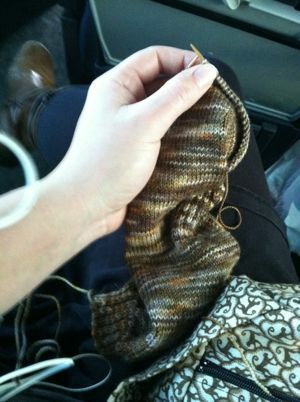 I began the toe decreases on a bus almost two weeks ago, when I was headed to a bachelorette gathering. I only had super short hiya-hiya circular needles with me, and the decreases were not so fun to try to work with those — just not enough give to comfortably do ssks and k2togs, and the bumpiness of the bus didn’t help. I really should put this back into my bag (with the dpns I need to keep decreasing), especially now that my commute involves a short bus ride each morning and afternoon! And here I am, working on the border of the wedding hap blanket I’ve been knitting…ahem…as a gift for two lovely people who got married in November. I’m so close. C+A, it’ll be done soon! Promise! 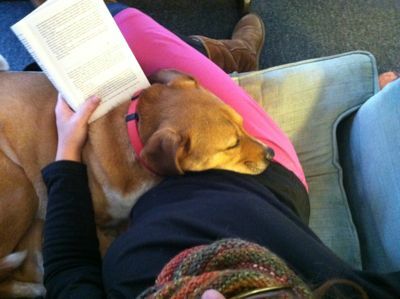 I’ve been wearing handknits, especially my cowls, this week. 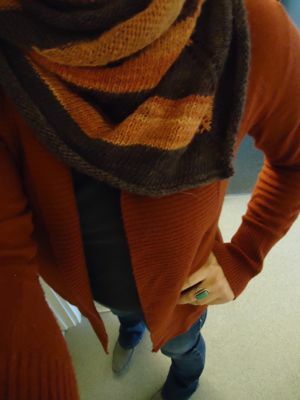 I love this wurm cowl so, so much. Handspun around my neck is one of the best things I can think of right now. More handspun around my neck. Remember when I made this stripey shawl over the summer because I was sick and didn’t have the focus necessary to follow the instructions for the Daybreak shawl? 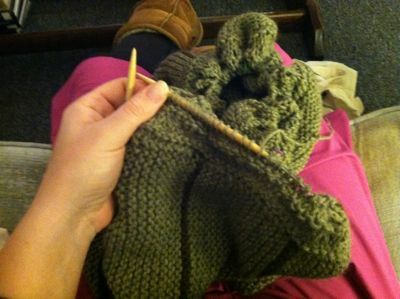 (One of these days I’m going to actually knit that.) 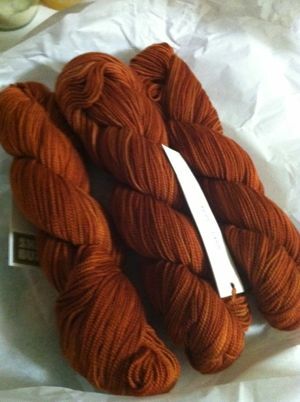 I love the colors, and the drape of this fabric of loosely knit singles is fantastic. And I love how it sort of goes with this cardigan I picked up on clearance at Banana Republic when I was visiting my parents for Christmas. This entry was posted in knitting and tagged boh, handspun, hap blanket, knits in action, knitting, plucky, touch of mink, vanilla sock, wedding shawl, wurm cowl by barefootrooster. Bookmark the permalink. 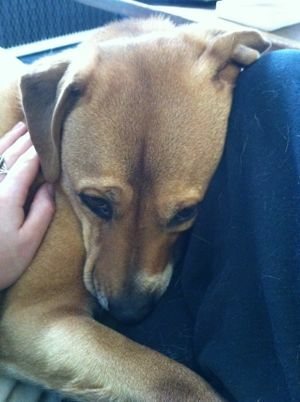 I am so not a animal person, but your cuddly photos of Boh could make even me want a dog.